Radio-relay trials have consistently shown that Helikites are by far the best persistent and reliable airborne radio relay platform in the world. This is not just due to their excellent flying performance, but also due to the ease at which radios, batteries and antennas can be steadily positioned in both altitude and attitude in order to give optimum propagation and reception of high bandwidth digital radio. Helikites are hugely sensitive interceptors of radio traffic and also superb at propagating clear and powerful radio signals over the horizon. Helikites also are excellent at holding radios in the best position for the most effective jamming of air, ground and satellite radio signals. Fibre-optic cables running up the line facilitate the operation of high altitude active radar and passive sensors that give over 100 miles range. When required, Helikites can rapidly, easily and permanently dominate much of the electro-magnetic radio spectrum within their line of sight. Webbing straps secure radio, radar and electronic payloads safe and dry in the space between the kite and the balloon cover. Even heavy payloads cause no instability in this position. Antennas that are lightweight can be attached almost anywhere. 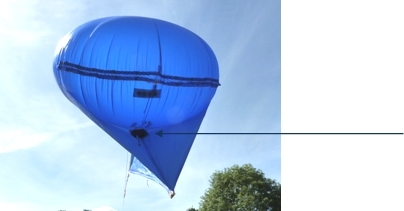 Behind the balloon is generally the most convenient for electronics and also for radar domes or radar reflectors. 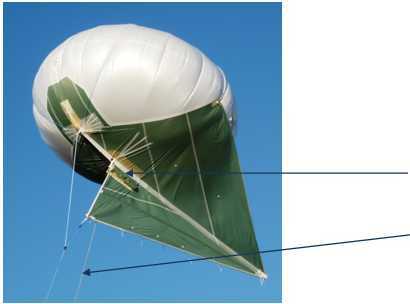 It is important to note that the angle of attitude of a Helikite is the same with or without wind, due to its natural stern heavy displacement. This feature is exceedingly useful for radio relay operations because it ensures that antennas are kept vertical whatever the weather. 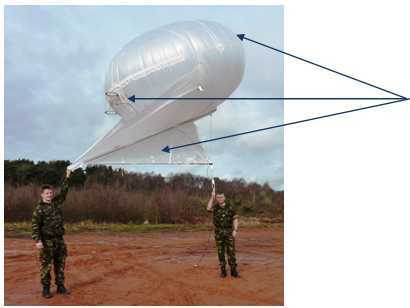 This is the reason that Helikites outperform all other small aerostats, UAV’s, manned aircraft and even tall masts in radio-propagation and reception performance. Powerful lithium batteries are held in a pouch at the top of the keel where they are easily accessible for quick changes. Power can be run up the flying line if required.